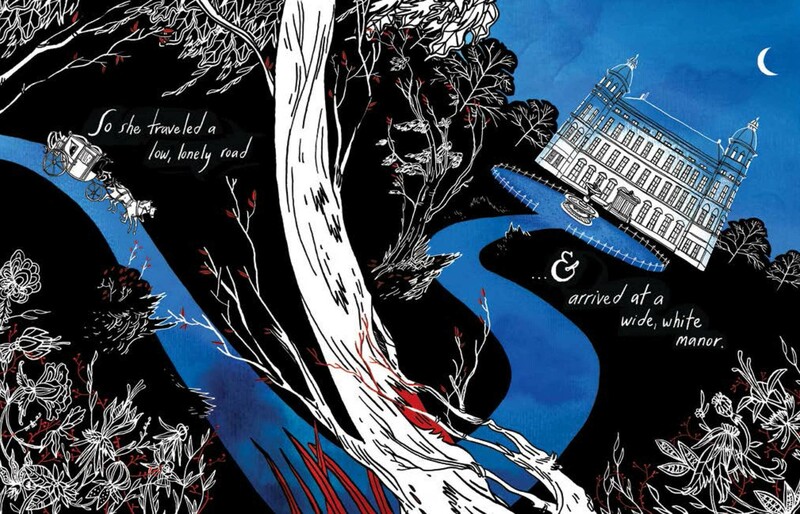 Through The Woods by Emily Carroll has been billed as a graphic novel but in fact it's a series of short stories. Seemingly based on folklore and dark fairytales, they all feature strange occurrences, mysterious disappearances and people who are not what they seem. The woods play an important role in each story, as they do in all the best fairytales, and this helps the whole collection feel cohesive. Some of the storylines were familiar to me already, others not, but they are all extremely readable and perfect for a dark winter's night by the fire. The stories are sparsely told with a minimum of text, but every word is perfectly chosen. Some of the stories are more memorable than others - my favourite is the one in which a young girl discovers that her brother's vivacious young fiancée is hiding a dark secret following a childhood accident - but they are all effective. As always with this type of fiction, the strength of most of them lies in what isn't said, rather than what is. The artwork throughout is stunning, with strong gothic elements and echoes of Edward Gorey among others. The colour palettes vary a little from story to story, although some have a stronger visual identity than others. This really is a beautiful and striking book to look at, and I found that after I'd read the stories I wanted to go back again and again to take in the artwork. A couple of readers on Goodreads and Amazon complain that this is 'not suitable for children', which is fine, because it's not meant to be - but I do think older children or teenagers who enjoy horror would probably love this as much as an adult; these are dark, campfire-type tales that a ghoulish child of around eleven and upwards would probably enjoy, particularly if they're a reluctant reader.